This week’s lunch uses some stuff we had in the freezer from Easter dinner. Feel free to use any meats you have in the freezer for your stew or buy kielbasa and some ham to make yours like ours! Heat a splash of oil in a large pot or dutch oven over medium high heat. Add onion and kielbasa and cook until the onion starts to get translucent. Add the carrots and ham and cook until they begin to soften. Add cabbage, and a sprinkle of oregano and thyme. 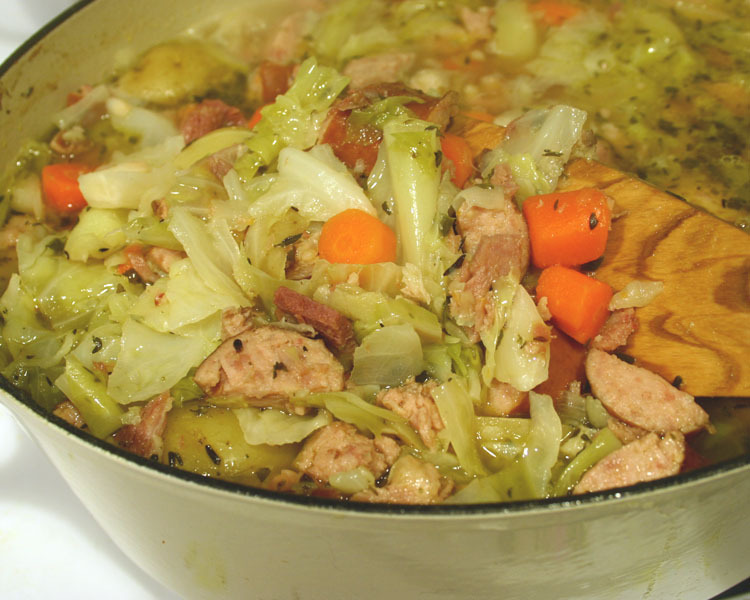 Cook until the cabbage begins to wilt and makes more room in the pot. Add the potatoes and cover with enough water to just cover everything. Pepper everything, bring to a boil, stir and cover. Lower heat to low and simmer for about 20 minutes, stirring every so often. Remove lid and cook 20 to 30 minutes longer or until everything is cooked through and starting to thicken. Taste now and salt only if you need it (the kielbasa and ham are really salty to start). Store in the fridge for the week. Fill a small pot with about 1″ of water and set a ceramic or glass bowl over it. Be sure the bowl isn’t touching the water. Bring the water to a simmer over medium low heat and add the bits to the bowl. Stir until the bits melt and turn off the heat. 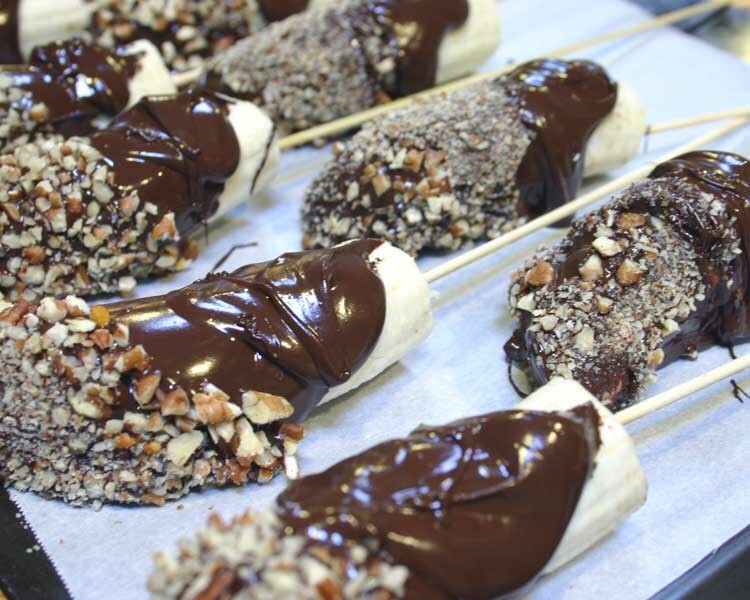 Dip the bananas into the melted chocolate and roll in the nuts. Transfer to parchment paper on a cookie sheet. When you have all of them dipped and rolled, pop into the freezer for the week. French toast is one of those things we only eat on weekends, but this version uses cooking spray instead of butter and 1% milk instead of whole milk or cream. The sweet berries make a drizzle of syrup go a long way. So…Voila! We now have a perfectly light french toast for everyday of the week. Preheat a nonstick skillet over medium heat. Coat with cooking spray or a little butter. Whisk eggs and milk together in a bowl or cup and sprinkle with a little salt, cinnamon and nutmeg. Place bread down in one layer on a dish and pour the egg mixture over it. Flip and turn each piece until they are fully soaked through. Cook each piece about 45 seconds to a minute on each side. 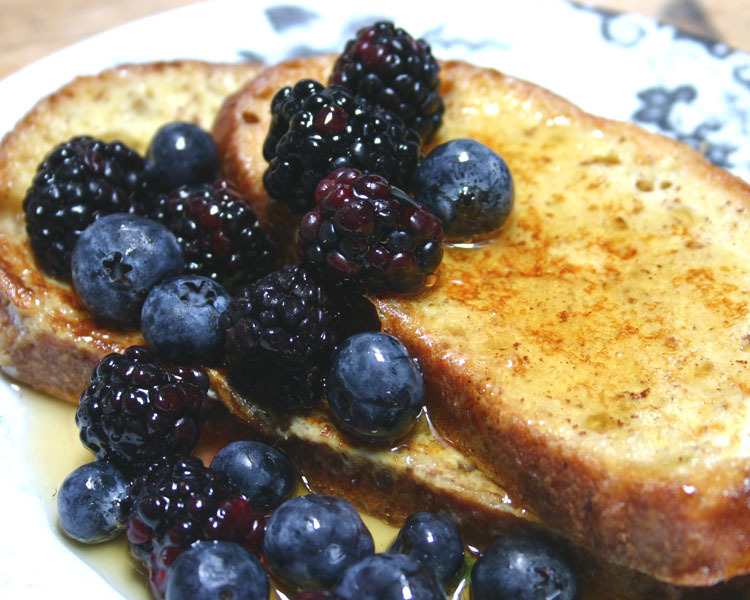 Serve with berries and syrup! Reheat in the microwave and eat! Prepare two plates with the spinach, oranges and beets. Put olive oil, vinegar, shallot and a little salt and pepper into a jar with a lid. Shake until well blended, salt and pepper to taste and drizzle over the salads. Heat a little olive oil in a nonstick skillet over medium heat. 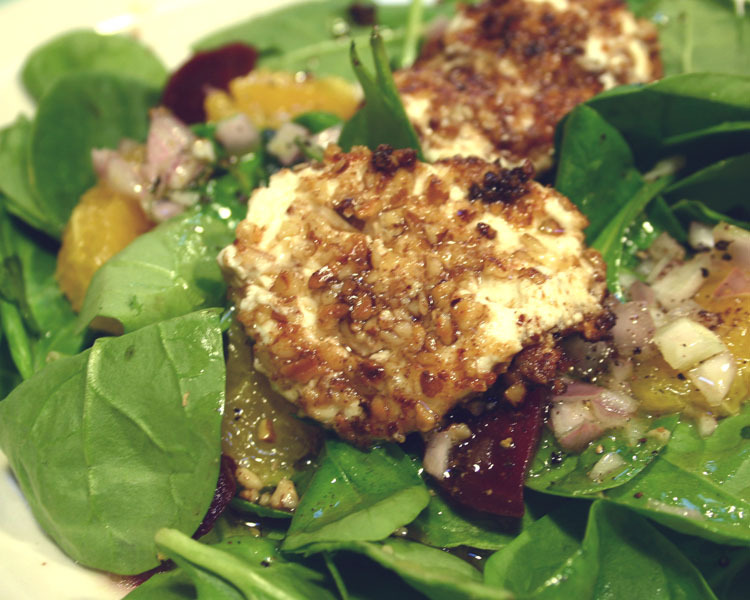 Dip the goat cheese into the egg and then dip into the pecans until well coated. Discard the egg, but save the pecans for the week in the fridge. Cook the medallions for about 1 minute on each side or until lightly browned. Serve on top of the salads. Take two bananas out of the freezer while you cook and eat dinner to soften slightly at room temperature. Eat!